This past year, I had the pleasure of participating in a Facilitative Mediation Skills class at the Center for Conflict Resolution in Chicago. A mediator’s main jobs are to listen and to help two parties have a productive conversation. That’s it in a nutshell. We aren’t there to dictate answers or solutions, but to help other people, who seem to be at odds with one another, come to their own conclusions and agreement. The reason this approach works is that when people define their own course of action, they are more likely to stick to it. The outcomes of the conversation are more achievable and sustainable when the two parties take ownership over them than if someone else just hands them the answers or tells them what to do. I couldn’t help but see the parallels with mentoring. As mentors, our job is not to have all the answers. We are there to help the mentee grow and develop. If we take it upon ourselves to be the “fixers”, we are not doing our mentees any favors. Instead, we need to listen and help our mentees think through issues and concerns and carve out their own paths. Fig. 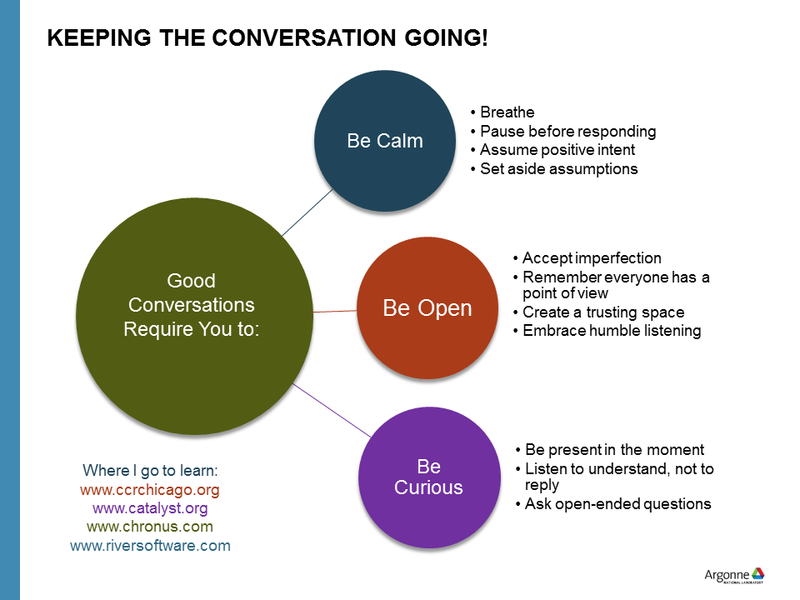 1: Be calm, open and curious to have a good conversation. Well, as one of the Mediation Skills coaches put it, we need to be calm, open and curious. Being calm doesn’t mean that you anticipate a conversation will be confrontational. On the contrary, being calm allows you to clear your mind and consider what the other person is saying before you respond. A few things you can do to be calm before and during a conversation are to take a few slow, deep breaths, pause before responding and assume the other person is coming from a place of goodwill or positive intent. Now that you are calm, you are in a position to be open. Open to what? Be open to other points of view, to making mistakes, to new ideas and questions that might come up. Be open to learning. This takes us to the last point, which is to be curious. Curiosity is a key skill in mentoring conversations. Curiosity probes us to want to know more. Where is the mentee coming from? How are they feeling? What is driving their issues and concerns? Curiosity is what allows us to ask open-ended questions. These are questions that invite more than just a yes or no answer. 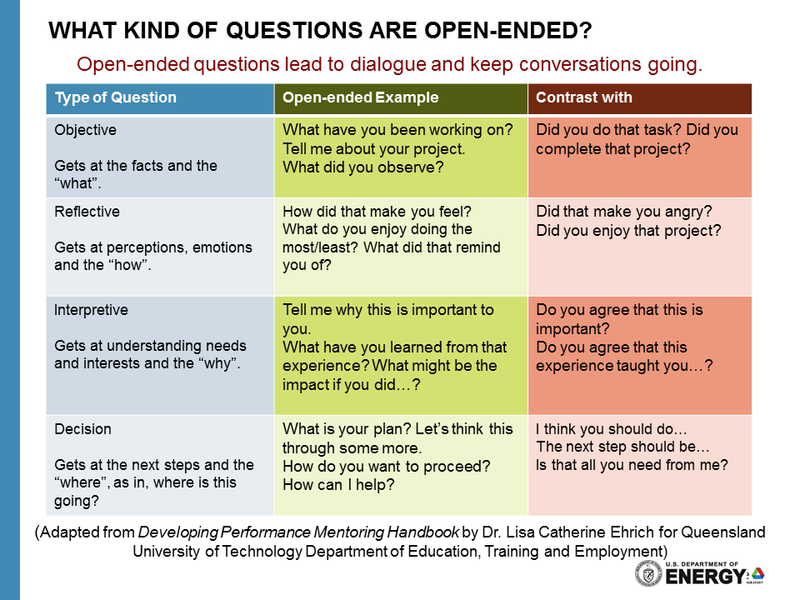 Open-ended questions keep the conversation going and can really get to the heart of the matter being discussed. Asking good questions is a powerful tool to foster learning. What kind of questions should you consider asking? Well, what is it that makes you curious? What do you need to know more of? There are questions that get at the “what, why, how, where.” It all depends on what information is needed to get closer to understanding. Examples of open-ended questions are shown in Figure 2. I also recommend two articles by Randy Emelo, Founder of River Software for mentoring solutions. These can be found on the River Software blog and at Chief Learning Officer. Be calm. Be open. Be curious. And have yourselves some great conversations! Figure 2: Open-ended questions invite more than yes or no answers. This entry was posted in Argonne's Mentoring Exchange, For Mentees, For Mentors, For Postdocs, Resources, Uncategorized and tagged communication, mentoring. Bookmark the permalink.